Working with the BV3 is highly flexible and convenient. You can place the compact machine in several blowing angles. 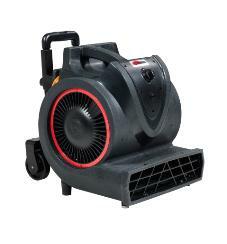 Get maximum efficiency by connecting up to 3 units via daisy chain, and weighing just 10 kg, the air blower is easy to carry, store and transport. Powered by a new 3-speed induction motor with thermal protection, the BV3 will save energy and costs. Also protected by the strong roto-molded shell, it is robust and ready to work in every condition. Due to its long lifetime and low power consumption, it ensures an attractive TCO. Cost-effective: New 3-speed induction motor with reduced power consumption. Reliable: Protected from motor overheating and by the strong roto-molded cabinet. Flexible: Easy to place in wanted blowing angle. Compact: Designed in modern style for easy handling and space saving storage. Can be stacked in 2 or 3 layers, has cord wrap and an optional retractable handle..